Stanford Advanced Materials (SAM) provides high quality copper powder used for thermal spraying coatings, purity up to 99.95%. Related products: Aluminum Powder for Thermal Spraying, Molybdenum Powder for Thermal Spraying, Nickel Powder for Thermal Spraying, Silicon Metalloid Powder for Thermal Spraying, etc. Copper is well known for its excellent electrical and thermal conductivities. 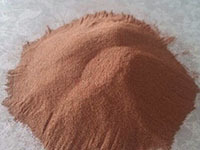 High purity copper powder for thermal spraying coatings is generally applied where good conductivity is needed.